I’m no chef, but if there’s one thing I love to do it’s drink cook. Were I ever to found a culinary school, it would have a unique philosophy: needs more booze! Past alcoholic experiments include: pork and cider-gravy, stout-stroganoff, Laphroaig Bolognese, rum-glazed drunken devils-on-horseback, and whiskey jam. In French cuisine there are the five mother sauces. In my cuisine there are the five mother boozes: beer, cider, wine, dark spirits and light spirits. Some weeks back I was trawling the wild game section of Moore Wilson’s, when I noticed they had whole rabbits. I love rabbit. I first tried it in Switzerland when I was eight, but you almost never see it here. I chose this strong Belgian dark ale (7%) because I felt the robust banana, spice and caramel flavours (with a hint of chocolate) would stand up well to a three-hour braising. Also because it was cheap. Seriously cheap. Like $7 from chaffer’s New World. What a steal! 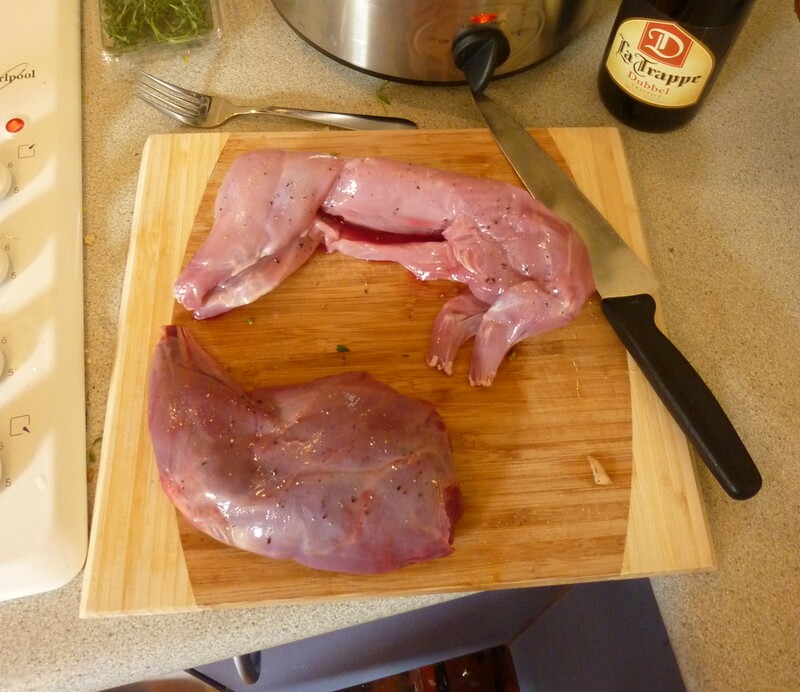 This rabbit we dubbed Edwin Pemberton (The First) and because Edwin was rather small in life, I also picked up a leg of wild hare from Moore Wilson’s (also because I’ve never eaten hare before). Hare is apparently a red meat. To start I crisped the bacon in a pan. 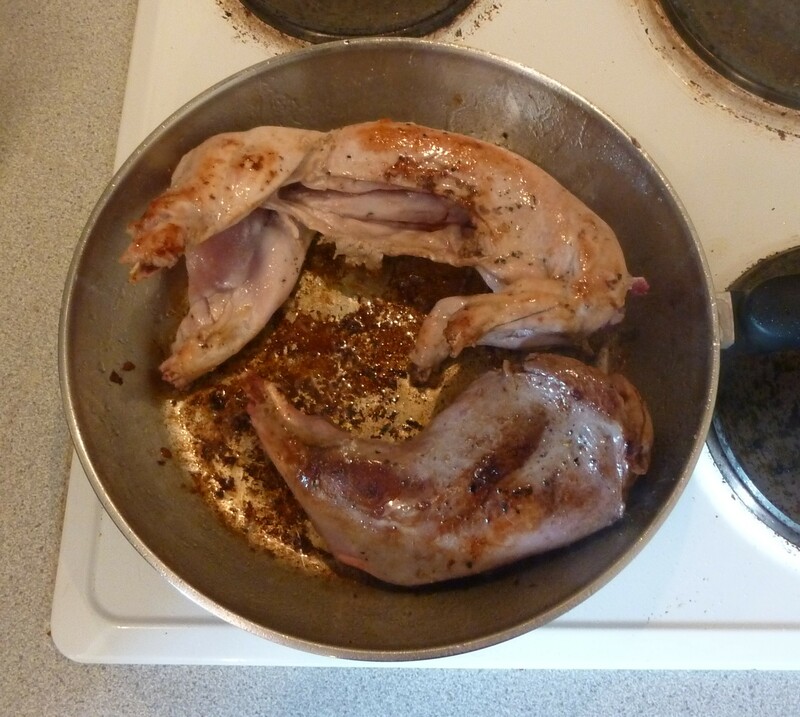 Then I seasoned the leporidae with salt and pepper, and seared them in the bacon fat. “Seared in bacon fat.” Now those are some beautiful words right there. Food poetry! Next, I took all the ingredients threw them in the slow cooker, poured over the Dubble, turned it to high and left it. No need to make things complicated after all. After it reached a simmer, I took the lid off and stuck my nose in. I was damn nearly decked by the cloud of booze vapour that erupted out of the pot! Pemberton was getting tender. I pulled him out after about three hours. In pieces, because he was so tender he was falling apart. I shredded the flesh and pulled out all the bones, or at least as many as I could find. Rabbits are full of sharp little ribs and vertebrae which are not pleasant to chew on. 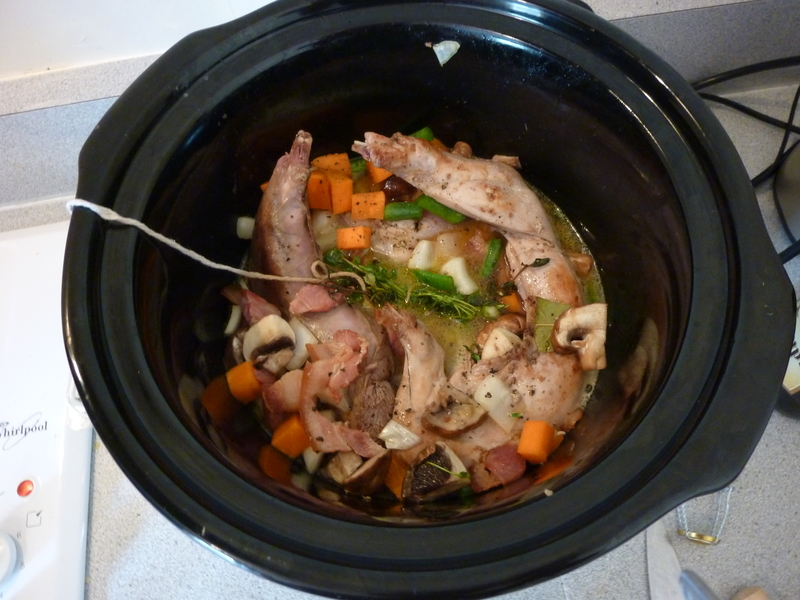 The rabbit meat I put back in to the pot. Interestingly the leg of hare didn’t fall apart. If anything, it was a little tougher than when I started. Everything in the slow cooker. I served the unthickened soup-like broth in bowls over pasta (except for the hare, which we elected to eat neolithic style, with hands and teeth). The broth was very rich, with the dominant flavours being beer and bacon. The sweet caramel and booze of the dubbel especially came through. The rabbit still managed to be slightly dry but had a lovely flavour, like rather ferric turkey.2 The hare was tough, but tasted good: like a subtle farmed venison. 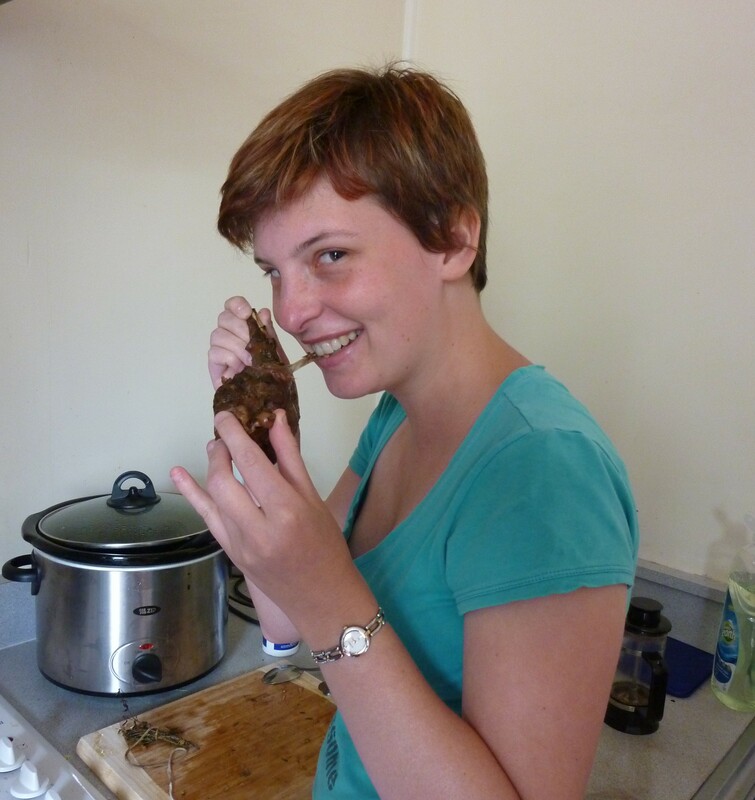 Hannah, demonstrating the correct neolithic eating technique. I have a fondness for La Trappe, ever since Steve from Hashigo and I had a ‘Trappist Lunch’, where we toured all the La Trappe beers we could get hold of. We started mid-afternoon and finished around 2 am. I can report: the beers were good and we were drunk. Although the left-overs, devoured the next day, were much less dry. An overnight soaking in the broth seemed to do the trick. 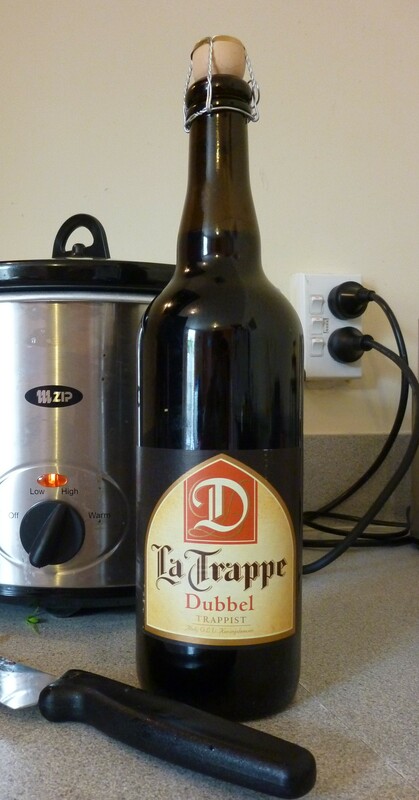 This entry was posted in My Alcoholic Kitchen and tagged Cooking with Beer, Dubbel, Food, La Trappe by Dylan J. Bookmark the permalink.